My part of London’s being gradually gentrified. I’m noting the warning signs – the launderettes being replaced by redundant fresh-fruit emporiums, estate agents proliferating even as the street drinkers melt away; the rough-and-ready Irish pub that’s suddenly been boarded up and now waits to became a sandwich outlet. Even the looming black tower block which dominates the district and which once housed the capital’s most brutal social security offices (leading to it being roundly cursed in song by New Model Army) is being stripped down to white bone and built up into luxury homes, yesterday’s painful memories now smothered under today’s property bubble. 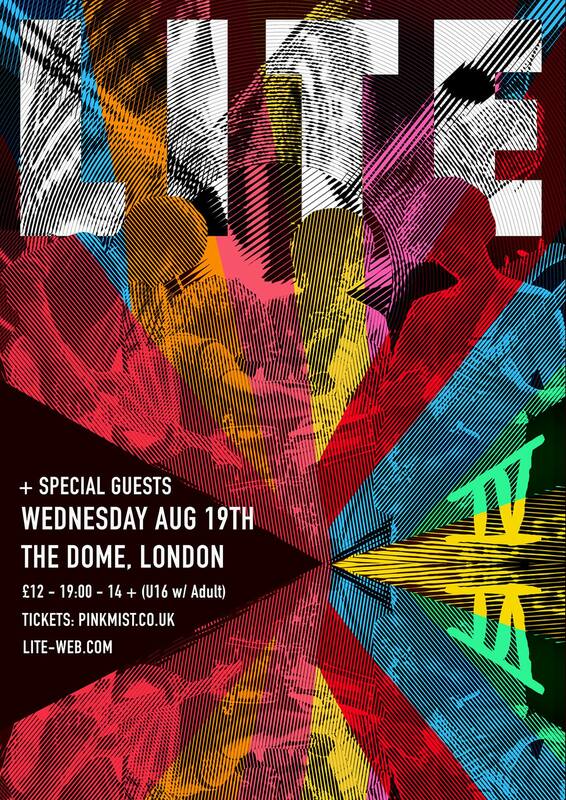 On August 19th Tokyo instrumental math heroes LITE return to London for a special one-off show at The Dome. A mainstay in the Japanese charts and something of an institution in their homeland, LITE released ‘Approaches 4‘ – six new live recordings including a new track called Balloon – for free download on May 19th. They’ll be joined by shape-shifting psych impresarios Knifeworld. Led by former Monsoon Bassoon/Cardiacs man Kavus Torabi, the London based octet have been hailed by everyone from ‘The Guardian’ to ‘Rock Sound’ to ‘The Line Of Best Fit’ to ‘Drowned In Sound’ and back again. And then there’s Axes, who in ‘Glory’ released one of the best math rock records of the last ten years. All three bands are on the same bill, for £12, which is pretty damned amazing. Please note that there are age restrictions on this gig – there’s a lower age limit of fourteen, and under-sixteens must be accompanied by an adult, so trainee adolescent psychonauts should take note (or take a fake ID). Up-to-date information on the gig is available here, while tickets are available here. More British psychedelic/post-progressive rock is out on the road at the same time, since former Oceansize and current British Theatre frontman Mike Vennart (also known for putting extra guitar flail into the live lineup of Biffy Clyro) is playing a couple of warm-up gigs for his appearance at the ArcTanGent Festival with music from his solo album ‘The Demon Joke’. ArcTangent has nearly sold out now (though you might still be able to grab one of the last tickets if you head over to the website now) but I’m plugging the other gigs now for the benefit of anyone within running distance. The Vennart live band features two other former Oceansizers (Richard “Gambler” Ingram and Steve DuRose) plus drummer Denzel Pearson. Support comes, variously, from Mike and Gambler themselves (as British Theatre, who’ve just released their first new music in three years – a free download single called ‘Cross The Swords‘ which I’ll be reviewing shortly), Colchester alt.rock songwriter Christie Isaac and assorted last-minute Leicestrians (ask the promoter). Vennart + British Theatre + guests (Robot Needs Home @ Firebug Bar, 25 Millstone Lane, Leicester, UK, Wednesday 19th August 2015 – 7:00pm) £10 – info and tickets here. Vennart + Christie Isaac (Colchester Arts Centre, Church Street, Colchester, Essex, CO1 1NF, UK, Thursday 20th August 2015 – 7.30pm) £11 – info and tickets here. A couple of tastes of Knifeworld and Cleft follow. If I’m going to be fiddling while Rome burns, I can’t imagine better company. All rock bands potentially contain storms. Oceansize were one of the few who genuinely sounded as if they did. For twelve years and four albums, the Manchester quintet careened along just at the underside of a breakthrough. They crafted a complex, roaring and passionate music, which took no prisoners but captured plenty of imagination. While they were around, they barrelled the psychedelic back into heavy metal, the dirt back into prog and the starscapes back into grunge. Perhaps it’s not such a surprise that in 2011 they finally (violently, and without explanation) blew themselves out – like a blazing oil-rig, suddenly snuffed. Maybe we shouldn’t shed too many tears for Oceansize, even though it was a shame to lose them. Sometimes a situation just comes to an end. Sometimes all of that volatile fuel just runs out, and you’re left with dead, falling machinery. Everyone involved has maintained a taut, wounded silence since the split: but now there’s British Theatre, made up of two former Oceansizers: Richard “Gambler” Ingrams and the band’s battered cherub of a frontman, Mike Vennart. Once wrapped inside a romantic name that made you think of heavy mechanisms or naked storms, they’re now hiding behind a monicker that spins off only confusing signals. A rarified, slightly stuffy textbook? A drawing-room comedy? Kitchen-sink bitterness? More important is what the music contains, and what the changes have churned up. There are strong strands joining British Theatre’s music to what came before with Oceansize. There’s the crooning bawl of Mike’s voice, for one – a perpetually skinned innocence rising to a pitch of blasted, despairing resistance. Having a tormented side comes as standard for the children of grunge: and British Theatre have carried Oceansize’s moody habits along with them. There’s also the flexible guitars (a mass of tones and liquescent washes) and the interest in long, shape-shifting song structures and their connection to expressiveness. The EP’s closing instrumental – Little Death #3 (6th Gen Degrade) – isn’t far off the wordless romantic-industrial pieces which used to complete Oceansize EPs: winding like a bashed-up river though the remains of a factory district. If Manchester were ever pummelled into the ground, this is what the aftermath might sound like – the sound swallowed up in a cocoon, gentle noises of sifting rubble and Mike’s crumpled guitar nosing in on the breeze, delivering misshapen bluesy asides. What’s changed is working method. Even before Oceansize fissioned, Gambler had been making a separate name for himself as a solo keyboard player and electronica artist. With Mike now also an enthusiastic convert (both men play “everything” in the new band), British Theatre take on a far more electronic approach, abandoning the metallic live-band contortions of Oceansize to take tips from laptop culture and dubstep, pasting and transparentizing layers of shaped instrumentation and sound effects, plunging deeper into the post-rock melt. ID Parade On Ice sets up what’s different now. Overlapping electronic polyrhythms, twinkling synth patterns, ghostly floating twinkles of piano flown in from distant rooms. Draughty guitar hums smudge into ominous yellow-wallpaper textures. Lopsided creaking sounds stalk through the music (part untended door, part straining hull) as do bony typewriter clacks and clinks of wire: the harp-trembling of guitar harmonics recall John Fahey. The brutal disaffection of the song, however, is pure Oceansize; as is Mike’s yearning scar of vocal and the bursting choruses. This may be a fresh start but some old pains linger, whether Mike’s still licking wounds from the split, acting out a teeth-baring Vennart snarl at paymasters or even taking a swipe at the controlling appetite of an audience: “Sit down, be the tormenter – make all of us dance / to songs cynical in tone… / Insist this is a cold magisterial charade, / a pornographic paid display… / Well, I’m glad to fake it for our sake.” Certainly the dark undercurrent of violence, desperation and disgust that seeped through Oceansize songs is still present, as Mike mutters “our engine’s thriving on ketamine and mogadon, / cut ear to ear, cut ear to ear. / Our engine’s thriving on violence and bleeding tongues – / let’s bite away, let’s bite our way out,” while riding a winding snare of melody across a landscape of shifting keyboard smears and stretched beats. While with Oceansize, Mike and Gambler often seemed to be merging the beefiness of Pearl Jam with the ambitious structures and songwriting of new-prog. With British Theatre, they’re as likely to sound like a grunged-up Talk Talk with pattering dance-loops and restless, frowning tattoos. Gold Bruise, a broodingly lovely ballad with ghostly siren sustain, mouthpiece buzz and Rhodes piano touches floating above a subtle dubstep pulse, shows how far they’ve travelled. It echoes the weightless cocooned take on urban melancholia which Bark Psychosis mined in the mid-’90s for ‘Hex’; but the lovely folk melody threading through it (sung by Mike in a heartbreaking murmur) recalls something far older. So does the subject matter – archetypal flaming youth and violent life, wound down to its fatal conclusion, only seen and mourned from the outside. Mike’s sung words, spacey and elusive, wreath the story in flashes and outcrops, transforming grit into mythology: “The boy that shot the bullet, decked in yellow gold; / pulled out of the river, angel’s hair for rope.” Despite the beautiful flares of lyrical colour, there’s little doubt that this is a mourning: in fact, for all of Mike’s gentle flow, a stricken raging against a waste and a path gone desperately wrong. “All the stranger’s battle cries / are back to front, wrong to right. / Nothing cradles you through all your crimes…. / You should be calling time / and bursting bubbles / but after all this time you couldn’t care less.” This is an aching, stirring return: the staging and the muscle have changed, but there are still deep storms here.